Fears continued to mount, as Items went to press, for the safety of Manic Street Preachers lyricist/guitarist, Richey James (full name Richard James Edwards), who went missing over a month ago and has not been heard from since. Last seen by staff at the Embassy Hotel in London, where he was staying, walking through the lobby just after 7am on February 1, Richey and singer James Dean Bradfield were supposed to have flown to the US the next day for hectic round of promotional interviews to publicise the band's forthcoming 30 date US tour. They never made it. Instead, Scotland Yard now believe Richey drove his silver Vauxhall Cavalier to his flat in Cardiff Bay, where he left behind credit cards, his passport and the bottles of Prozac - a powerful anti-depressant - that his doctors had recently prescribed for him. It is believed that Richey had something like £2,000 in cash on him, withdrawn in daily £250 clumps from his cash point machine over the previous week or so, and that he had left behind more medication and a packed suitcase back at the hotel. The Manics' manager Martin Hall officially reported Richey as missing to Harrow Road Police Station, in London, the day after he disappeared. For the next two weeks, however, the band kept his disappearance a secret. They were hoping he would turn up, or at least get in touch with one of them to let them know he was alright. They were hoping, in the words of the band's press officer and close friend, Gillian Porter, "that this just wasn't happening." When Richey's car was finally discovered on Friday February 17, at Auste Service Station on the M4, just a short walk from the Severn Bridge and a well-known suicide spot, police feared the worst and the band went public in their appeal to find their troubled soul mate. 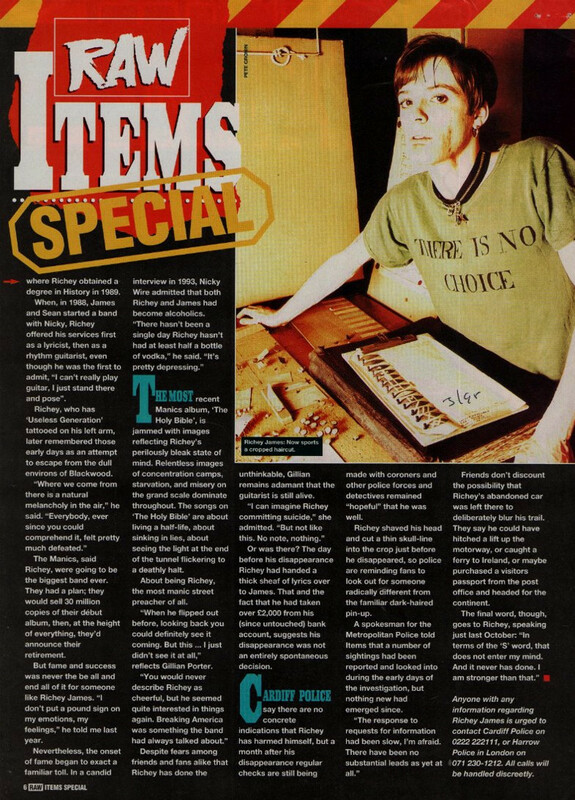 As bassist Nicky Wire (née Jones) out it: "If Richey doesn't want to come back, then that's fine. But we just want him to give us a call or send us a postcard." Cardiff Police immediately ordered a thorough search of the Severn Estuary. "The river is tidal and it could not be dredged at that point," Detective Inspector Frank Stockholm explained. "But we are checking to make certain there are no unidentified bodies that have been washed up." "This is completely out of character and everyone's very worried about him," said Richey's distraught father, Graham Edwards, speaking from the family home in Wales. One of Richey's oldest friends, Byron James, claimed that "Richey would never do anything without a reason. He's a very intelligent man. He wouldn't just disappear like this under normal circumstances." But then, what are normal circumstances for someone whose infamous 'mood swings' had already led to him being hospitalised as recently as last summer? Admitted to a private clinic in Roehampton, London, after a brief stay in a Cardiff NHS ward, his immediate symptoms were diagnosed as 'alcoholism, anorexia, and self mutilation'. "I wasn't coping very well," the 27-year-old admitted woefully when he was released. "My mind was quite strong but I pushed my body further than it was meant to go." RAW's Howard Johnson, who got to know Richey through working with the Manics, says he was "shocked" by how "withdrawn and ill he looked the last time I saw him," which had been briefly after a Manics concert in Norwich last October. "He had come to my wedding in May and although he seemed a bit wistful there was no real hint of the traumas that must have followed. I remember he said how great he thought it was that two people could be so wrapped up in each other and in love. He said he could never imagine himself in a similar situation." "It wasn't a breakdown, it was much worse than that," vocalist/lead guitarist James Dean Bradfield had told Howard at the time of Richey's hospitalisation just a few weeks later. "Richey went bonkers. Something flipped in his head. It was...dramatic!" The Manics bleak Punk Metal had attracted a healthy cross section of tribes, from out-and-out hair-shakers to the panda-eyed Indie crowd, collecting a string of Top 40 singles along the way, and three critically acclaimed hit albums. Indeed, on paper it seemed they were set for worldwide acclaim. The now-cancelled US tour apart, the band had recently begun negotiations to provide the theme tune to the super-hyped forthcoming Judge Dredd movie, starring Sylvester Stallone. That too has been cancelled while everybody anxiously awaits the outcome of this latest trial. "Maybe if he'd stayed at university then perhaps he could have plotted things out better, formed a barrier against the same things that would always have been in his head," James told RAW. "Maybe an ordinary life could have stopped this." The bond between the members of the Manics (completed by drummer Sean Moore) is well known. They all come from the close-knit mining community of Blackwood, in the heart of South Wales. Richey had been brought up at his grandmother's house 'cos his parents, both hair stylists, were too young to afford to keep him. They had all met at school, Pontllanfraith Juniors. Richey is remembered as a bookworm who emerged with three A levels; he and Nicky went to Swansea University, where Richey obtained a degree in History in 1989. 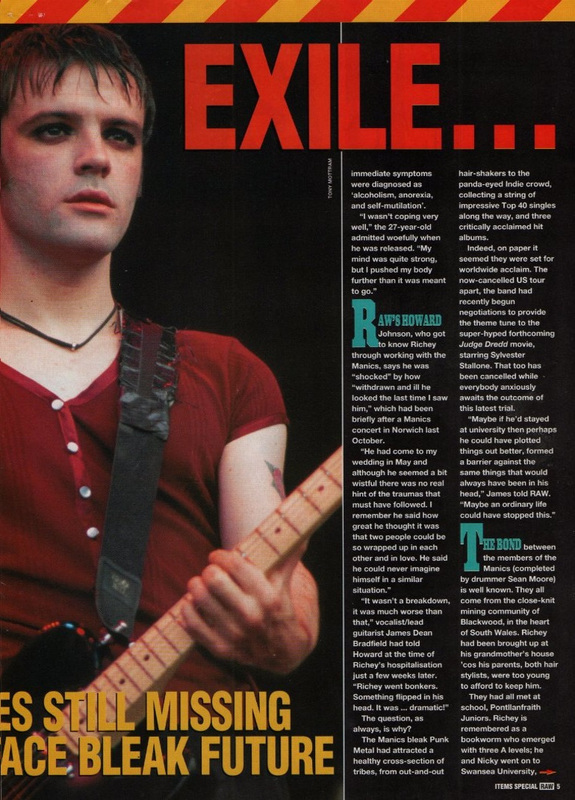 When, in 1988, James and Sean started a band with Nicky, Richey offered his services first as a lyricist, then as a rhythm guitarist, even though he was first to admit, "I can't really play guitar, I just stand there and pose." Richey, who has 'Useless Generation' tattooed on his left arm, later remembered those early days as an attempt to escape from the dull environs of Blackwood. "Where we come from there is a natural melancholy in the air," he said. "Everybody, ever since you could comprehend it, felt pretty much defeated." The Manics, said Richey, were going to be the biggest band ever. They had a plan; they would sell 30 million copies of their debut album, then, at the height of everything, they'd announce their retirement. But fame and success was never the be all and end all if it someone like Richey James. "I don't put a pound sign on my emotions, my feelings," he told me last year. Nevertheless, the onset of fame began to exact a familiar toll. In a candid interview in 1993, Nicky Wire admitted that both Richey and James had become alcoholics. "There hasn't been a single day Richey hasn't had at least half a bottle of vodka," he said. "It's pretty depressing." The most recent Manics album, 'The Holy Bible', is jammed with images reflecting Richey's perilously bleak state of mind. Relentless images of concentration camps, starvation, and misery on the grand scale dominate throughout. The songs on 'The Holy Bible' are about living a half-life, about sinking in lies, about seeing the light at the end of the tunnel flickering to a deathly halt. 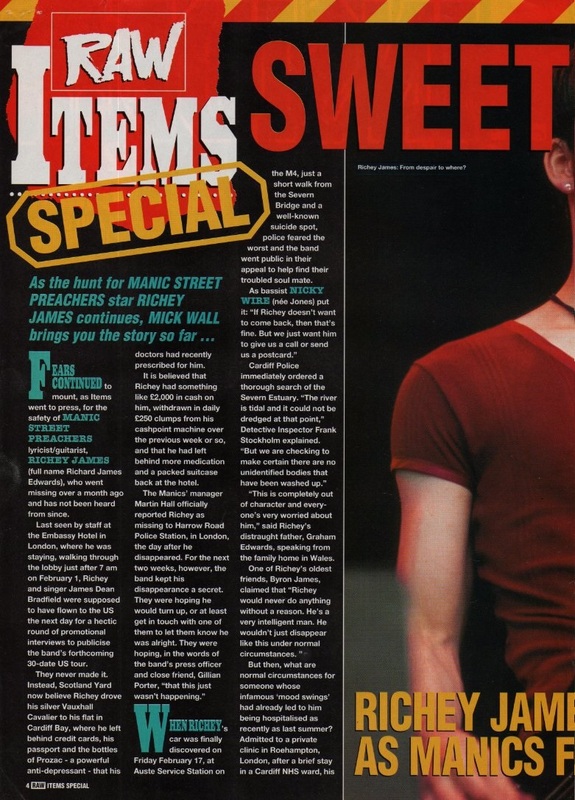 About being Richey, the most manic street preacher of all. "When he flipped out before, looking back you could definitely see it coming. But this...I just didn't see it at all," reflects Gillian Porter. "You would never describe Richey as cheerful, but he seemed quite interested in things again. Breaking America was something the band had always talked about." Despite fears among friends and fans alike that Richey has done the unthinkable, Gillian remains adamant that the guitarist is still alive. "I can imagine Richey committing suicide," she admitted. "But not like this. No note, nothing." Or was there? The day before his disappearance Richey had handed a thick sheaf of lyrics over to James. That and the fact that he had taken over £2,000 from his (since untouched) bank account, suggests his disappearance was not an entirely spontaneous decision. Cardiff Police say there are no concrete indications that Richey has harmed himself, but a month after his disappearance regular check are still being made with coroners and other police forces and detectives remained "hopeful" that he was well. Richey shaved his head and cut a thin skull-line into the crop just before he disappeared, so police are reminding fans to look out for someone radically different from the familiar dark-haired pin-up. A spokesman for the Metropolitan Police told Items that a number of sightings had been reported and looked into during the early days of the investigation, but nothing new had emerged since. "The response to requests for information had been slow, I'm afraid. There have been no substantial leads as yet at all." Friends don't discount the possibility that Richey's abandoned car was left there to deliberately blur his trail. They say he could have hitched a lift up the motorway, or caught a ferry to Ireland, or maybe purchased a visitors passport from the post office and headed for the continent. The final word, though, goes to Richey, speaking just last October: "In terms of the 'S' word, that does not enter my mind. And it never has done. I am stronger than that."